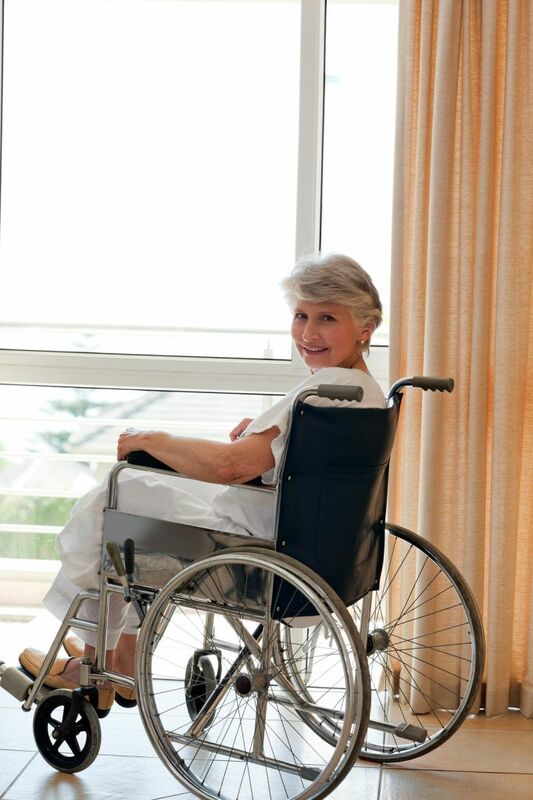 Accessibility to fresh air and a connection to the outdoors for those with physical disabilities are especially important in skilled nursing and personal care facilities, multi-family dwellings, and hotels, along with classrooms and dormitories. To help ensure this access, windows capable of meeting operating force and motion requirements of International Code Council/American National Standards Institute (ICC/ANSI) A117.1, Accessible and Usable Buildings and Facilities, are being more commonly specified in the United States. This trend can be expected to expand into Canada. In December 2013, Statistics Canada’s Canadian Survey on Disability (CSD) found more than 11 per cent of the country reported disabilities related to pain, flexibility, or mobility—often all three simultaneously—with more than one-quarter classifying it as ‘severe’ in nature. Smaller percentages reported visual, auditory, or dexterity impairments. All percentages were significantly higher when only groups over age 65 were considered. More than 80 per cent of disabled persons used an assistive device such as a wheelchair, arm support, specialized computer, or hearing aid. Accessibility of operable windows has not been specifically addressed in the National Building Code of Canada’s (NBC’s) barrier-free provisions, other than a general requirement in “Performance of Windows, Doors and Skylights” requiring they “are easily operable,” meeting the Canadian-only North American Fenestration Standard (NAFS) limits. Even when not required, accessible operating windows may be a very desirable feature of the occupied spaces being designed, making it easier for everyone to enjoy the fresh air. Accessibility as a general building design concept has its roots in disciplines known throughout the years as barrier-free, universal, or inclusive design; other terms have included ‘design-for-all’ and ‘aging-in-place.’ For clarity, the term ‘accessibility’ will be used in this article to refer to any of these design protocols, recognizing some differences in emphasis and design criteria exist. Various protocols have placed more or less emphasis on the use of operable windows. Before exploring considerations for operable windows in this country, it is important to understand the situation south of the border. Even in Canada, operable windows intended for use in accessible spaces are often mistakenly called ‘ADA windows.’ The Americans with Disabilities Act (ADA) is a law, not a building code, specification, or test method—as such, it is missing many of the necessary technical requirements for compliance testing. It is not the intention of this article to summarize or interpret building code requirements or enforcement provisions in Canada or in the United States; rather, it draws attention to important design considerations and cites relevant examples of best practices. Local authorities having jurisdiction (AHJs) should be consulted in determining applicability and in defining detailed requirements for any given structure or space. While detailed requirements vary, all U.S. references generally cite ICC/ANSI A117.1 for window operating forces and motions. It addresses three types of dwelling or sleeping units: Accessible, Type A, and Type B. All three cite Sections 308 and 309 of the standard. Operating parts of windows must comply in Accessible and Type A units, unless otherwise specified by local AHJs. Operating parts of windows need not comply in Type B units, unless otherwise specified by local AHJs. As might be expected, Accessible and Type A units also ‘count’ as Type Bs, since they meet more stringent requirements. 309.1 General. Operable parts required to be accessible shall comply with Section 309. 309.3 Height. Operable parts shall be placed within one or more of the reach ranges specified in Section 308. 309.4 Operation. Operable parts shall be operable with one hand and shall not require tight grasping, pinching, or twisting of the wrist. The force required to activate operable parts shall be 5.0 pounds (22.2 N) maximum. Recognizing the need for a repeatable, reproducible, and uniform test method, AAMA formed a task group and developed AAMA 513-12 to fill the void. Efforts are currently underway to have AAMA 513-12 referenced as a compliance test method in the next version of ICC/ANSI A117.1. In addition to forces and motions, the specifier must ensure operable windows are located and detailed in a way that meets the ‘reach’ limitations of ICC/ANSI A117.1. (One typical diagram is shown in Figure 1). Different height requirements apply to ‘obstructed’ and ‘front’ reach. There are also physical limits on clearances and protrusions, as well as approach area and threshold height (for terrace doors and sliding glass doors). It is important to remember building codes represent only minimum requirements. Even when not required, accessible operating windows may be a desirable feature of the occupied spaces being designed, making it easier for everyone to enjoy the fresh air. Where operable windows are provided in rooms that are required to be accessible in accordance with Sections 1107.5.1.1, 1107.5.2.1, 1107.5.3.1, 1107.5.4, 1107.6.1.1, 1107.6.2.1.1, 1107.6.2.2.1 and 1107.6.4.1, at least one window in each room shall be accessible and each required operable window shall be accessible. For most condominiums, apartments, skilled nursing facilities, and hotels/motels, operable windows in Accessible and Type A dwelling and sleeping units must comply. 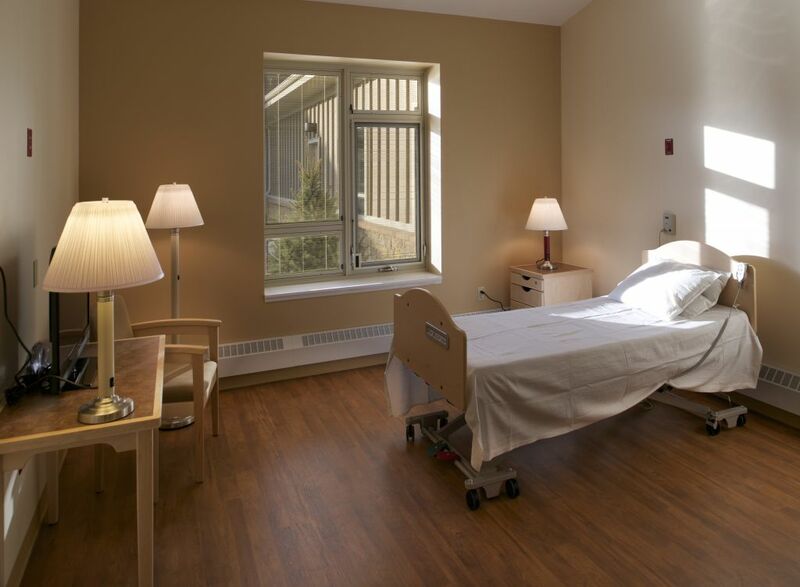 Operable windows in hospital patient rooms are keyed, and intended for custodial or nursing staff operation only, since emergency ventilation and egress is addressed by mechanical systems and automatic smoke dampers. As yet, the special needs of staff members with physical disabilities have not been addressed relative to operable windows. In addition to forces and motions, specifiers must ensure operable windows are located and detailed in a way that meets the ‘reach’ limitations of ICC/ANSI A117.1. Different height requirements apply to ‘obstructed’ and ‘front’ reach. An example of a typical diagram is shown here. For basic air, water, and structural performance of windows, doors, and skylights, the National Model Building Code of Canada (NBC) 2010 version references the North American Fenestration Standard (NAFS), which is developed and maintained jointly by AAMA, Window and Door Manufacturers Association (WDMA), and the Canadian Standards Association (CSA) as AAMA/WDMA/CSA 101/I.S.2/A440-08. While most requirements are harmonized between the United States and Canada, a Canadian supplement adding further requirements for snow loads, air exfiltration, product marking, screen retention, and other prescriptive items has been promulgated by CSA. In the Canadian-only sections of NAFS, operating force maximums for most window types are less than U.S. operating force maximums for standard gateway-size test units, accessibility notwithstanding. The current NBC does not require barrier-free or accessible design for all residential units, but contains requirements to be applied in cases where the AHJ designates such criteria.3 These accessibility requirements most commonly apply to large, multi-storey residential buildings, hotels, skilled care facilities, and dormitories. Most Canadian provinces set a minimum number (or percentage) of residential units required to be designed for accessibility, or that can be adapted for accessibility. In some provinces, these minimums apply only to publicly funded projects, while in others privately funded projects are also affected. Applicability to renovation projects versus new construction also varies by jurisdiction. Several Canadian municipalities have raised the bar still higher, setting mandatory accessibility requirements, or recommending design and construction standards over and above provincial building codes. Accessibility of operable windows has not been specifically addressed in NBC’s barrier-free provisions, other than a general requirement in “Performance of Windows, Doors, and Skylights” requiring they “are easily operable,” meeting the Canadian-only NAFS limits noted above. However, some Canadian provinces and municipalities have adopted more stringent window-specific standards or guidelines for accessibility and barrier-free design. Again, local AHJs should be consulted in determining applicability and defining detailed requirements for any given structure or space. Window-specific standards and guidelines adopted by provinces and municipalities—mandatory or non-mandatory—include, but are not limited to, the following illustrative examples, paraphrased for brevity. The non-uniformity of these standards and guidelines, while presumably responsive to local preferences, pose challenges for the product designer striving for broad market applicability of a tested system. It is also important to remember lowered sill height to allow for views and hardware operation from a wheelchair may require the addition of fall prevention guards or limited opening devices. This, in turn, can affect the use of operable windows as routes of egress in un-sprinklered buildings. For Standata Building Code Interpretation−Adaptable Dwelling Units (Alberta Municipal Affairs and Housing [MAH], 2008), non-mandatory best practices include providing windows with sill height less than 865 mm (34 in.) and easy-to-use operating devices requiring no tight grasping or twisting of the wrist. To ensure view and connection to the outdoors from a wheelchair, British Columbia Office of Housing and Construction Standards’ 2007 Building Access Handbook requires windows in common areas should have a sill height less than 750 mm (29.5 in.). Both operable window hardware and windowcovering (e.g. drapes and blinds) controls should be located within wheelchair-accessible height and reach, and usable by those with limited use of their hands. 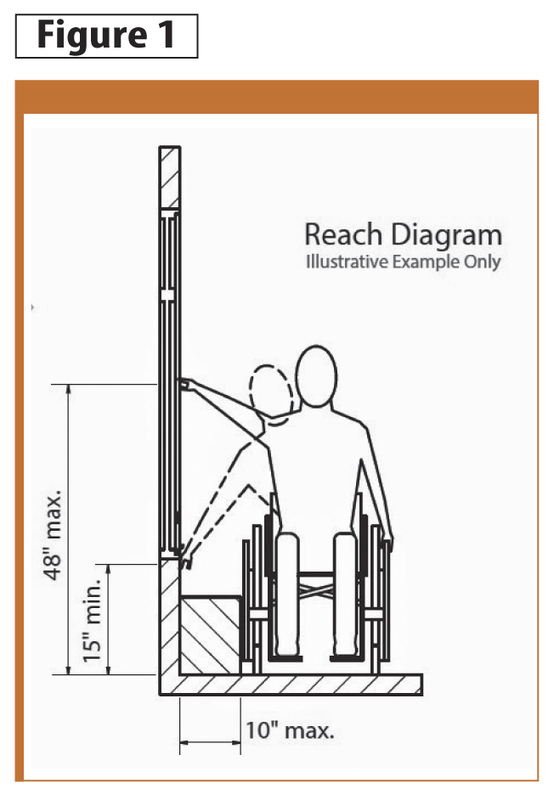 Interestingly, different reach limitations are defined for adult males, adult females, and children in wheelchairs, none of which are the same as those shown in ICC/ANSI A117.1. Under the 2011 Nova Scotia Building Code Regulations, Schedule C−Barrier-Free Design, accessibility requirements apply to a broad spectrum of building types, and controls for the “operation of building services or safety devices” must be accessible. 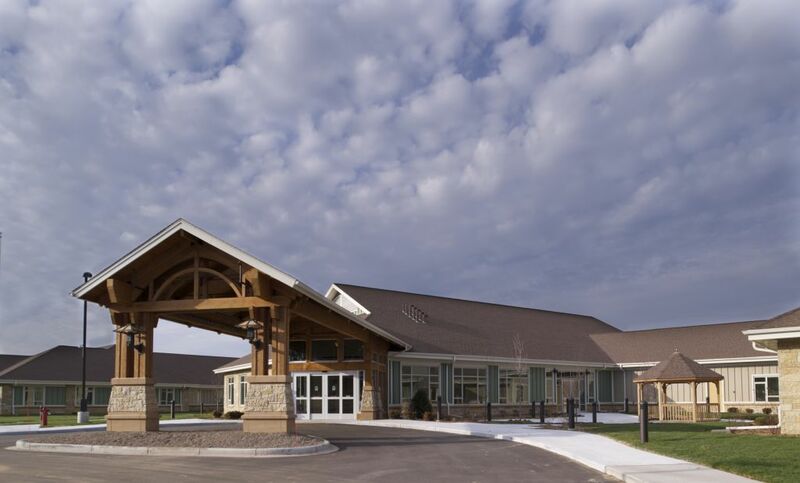 non-institutional and successfully integrated with a building’s function, form, and architectural quality. Some Canadian provinces and municipalities have adopted more stringent window-specific standards or guidelines for accessibility and barrier-free design. In Toronto, for example, lever-style window hardware should be mounted within reach—lower than 1065 mm (42 in.). Balconies must be usable throughout the year by seniors and persons with disabilities. Window sill height should be less than 760 mm (30 in. ), and transoms located out of the seated line-of-sight. 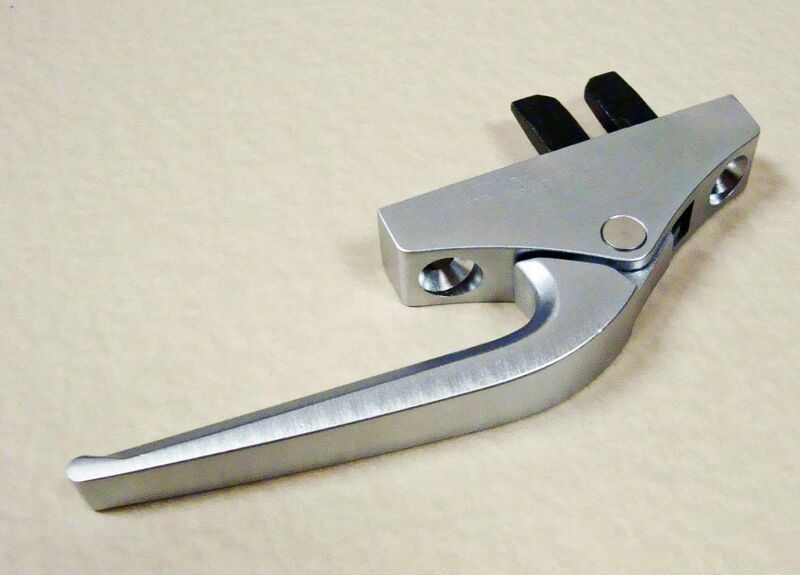 Lever-style window hardware should be mounted within reach, lower than 1065 mm (42 in.). Window covering controls should also be mounted low. New construction or renovation of city-owned or -operated buildings is covered by the 2010 City of Winnipeg Accessibility Design Standard. Wheelchair side reach allowances are set that are different than the aforementioned B.C. ones and from those shown in ICC/ANSI A117.1. Large expanses of glass must be marked for the visually impaired, and sill height maintained at 760 mm (30 in.) or less for view. 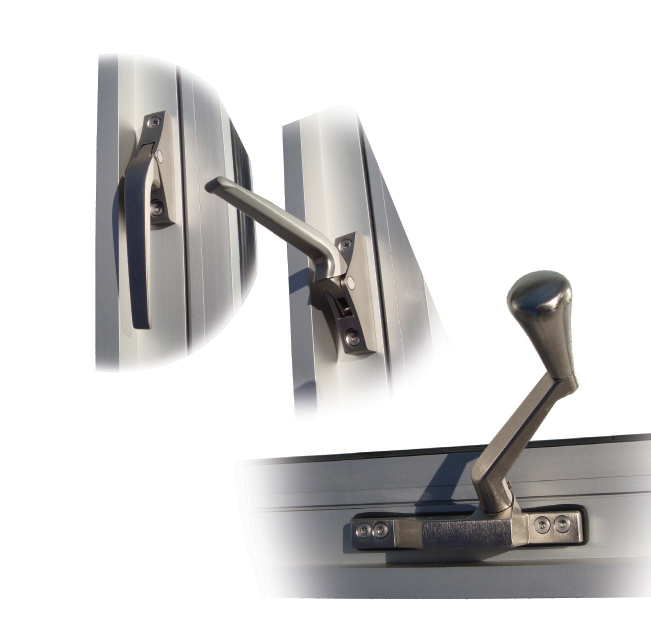 Window opening hardware must be mounted between 400 and 1200 mm (15 and 47 in.) above the floor, and allow one-hand operation without tight grasping, pinching, or twisting of the wrist. 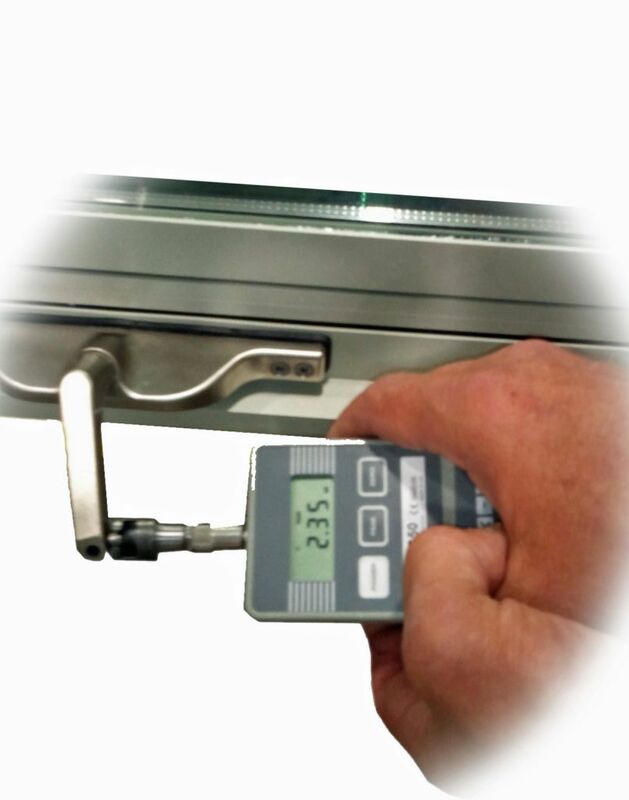 The purpose of the AAMA 513-12 laboratory test method is to demonstrate a given window unit, as designed, is capable of being operated with forces and motions consistent with ICC A117.1 limitations, if properly installed, adjusted, and maintained. In the Canadian-only sections of NAFS, operating force maximums for most window types are less than U.S. operating force maximums for standard gateway-size test units, accessibility notwithstanding. All four actions must meet accessibility requirements for force, motion, and reach, and be performed using one hand. commonly used in low-rise and mid-rise buildings where larger sizes, higher loading requirements, limits on deflection, and heavy use are expected. commonly used in high-rise and mid-rise buildings to meet increased loading requirements and limits on deflection, and in buildings where frequent and extreme use of the fenestration products is expected. By grouping accessibility testing of “hardware and weather seal packages,” used across a range of individual products, one test assembly can qualify multiple individual products. AAMA 513 is a useful laboratory test method, eliminating the variables of wind and weather that could affect operating force onsite, as well as addressing critical issues such as sampling, measurement precision, test equipment, methodology, and inspection. As previously noted, efforts currently are underway to add reference to AAMA 513-12 in ICC/ANSI A117.1. For accessible units, certain “reductions” in air infiltration, water resistance performance requirements shall be permitted, when compared to conventional CW and AW Class testing, given the desirability of minimizing operating forces. Requirements for operable parts of windows were first added to ANSI A117.1 in 1992, although a test method has never been referenced. Efforts currently are underway to have American Architectural Manufacturers Association (AAMA) 513-12, Standard Laboratory Test Method for Determination of Forces and Motions Required to Activate Operable Parts of CW and AW Class Operable Windows, referenced as a compliance test method in its next version. Air Infiltration: 1.5 times the maximum air infiltration specified in AAMA/WDMA/CSA 101/I.S.2/A440, for the type and class tested is allowed but no greater than 1.0 l/s/m2 (0.2 cfm/sf) at 75 Pa (1.57 psf). Water Resistance: …conduct [AW Class] water resistance testing at … 20% of inward acting design pressure for the project for AW Class, but not less than … 390 Pa (8 psf). Design Wind Pressure: Design loads shall be based on project requirements, or a minimum of … 1920 Pa (40 psf) for AW products (whichever is greater). It should not be expected standard, off-the-shelf operable windows can be adjusted to meet accessibility requirements, even when properly located in plan and section. Especially on large windows, achieving ease-of-operation with restricted motion will likely require specially designed compression weatherseals and low-friction hardware components. Hardware must be selected that ensures windows do not fall shut under their own weight, or require two hands to hold closed and lock simultaneously. Project-out awning vents cannot usually be manually operated due to the requirement for hold-open friction. Out-swing casement vents cannot be hand-operated due to the requirement for one-hand operation. Roto-operators can be provided for both of these vent types, and provide mechanical advantage to overcome friction and help lift the weight of glazing infill. Project-in hopper vents require glass to be lifted, and typically are not fitted with roto-operators. The CSD found more than 80 per cent of disabled persons used an assistive device such as a wheelchair, arm support, specialized computer, or hearing aid. It is important to remember building codes represent only minimum requirements. Hung windows require the occupant to lift the sash to open it, as well as to apply added force to overcome friction of weather-seals. Counter-balancing devices may not provide adequate force assistance to get large windows to operate at less than 22 N (5 lbf). Similarly, operation of horizontal sliding sash requires both inertia and weather-seal friction to be overcome. This can limit the applicability of manually operated hung and sliding windows in accessible spaces under current ICC/ANSI A117.1 limits. It is important to keep in mind motorized and mechanical operators have long been available for almost any window type; single- and double-hung, horizontal sliding, parallel-opening, or dual action; as well as the projected vents addressed previously in this article. As long as forces and motions necessary to activate and operate motorized and mechanical features meet the requirements of ICC/ANSI A117.1, these may be deemed accessible operator types. The use of insect screens may limit accessibility options for certain vent modes and hardware packages. Typically, controls and cords for blinds, drapes, or shades are not required to be accessible. One must locate and detail operable windows in a way that meets the ‘reach’ limitations of ACC/ANSI A117.1. One typical diagram is shown in Figure 2. Different height requirements apply to ‘obstructed’ and ‘front’ reach. There are also physical limits on clearances and protrusions, as well as approach area and threshold height (for terrace doors and sliding glass doors). Production-line testing of operating force can help ensure windows leaving the factory are complaint with AAMA 513-12 requirements. Accessible operating window products require additional care in installation, final adjustment, and maintenance to achieve and maintain compliance. Plumb, square, and level installation is critical. Building settlement can affect operating forces, and necessitate post-installation adjustment. Standard operable windows cannot always be adapted to achieve accessibility at a later date. The fieldwork necessary vary widely with application and window type. Adaptation may be as simple as hardware adjustment, or virtually impossible without complete reconfiguration of window openings and surrounding conditions. If adaptability is desired, the design team is strongly encouraged to develop a window accessibility plan early in the design process, then detail and specify products accordingly. The Canadian Survey on Disability (CSD) found more than 11 per cent of the country reported disabilities related to pain, flexibility, or mobility—often all three simultaneously—with more than one-quarter classifying it as ‘severe’ in nature. All percentages were significantly higher when only groups over age 65 were considered. The same subcontractor that provides windows often provides doors for access to balconies, terraces, and patios; however, accessibility requirements for doors are somewhat more complex than for windows. Canadian provinces and municipalities adopt more stringent standards and guidelines than the NBC for terrace and patio doors, just as with windows. Where such balcony access requirements are adopted, minimum clear width typically is set at 760 to 800 mm (30 to 31.5 in. ), kick plates need to be provided, easy-to-operate hardware located at an accessible height, and closers must limit opening force as well as closing lag time. Adequate manoeuvring space must be provided on the balcony, and on the latch side of the door. Swinging terrace door thresholds must not exceed 13 mm (1/2 in.) in height and must be bevelled, requiring careful design to avoid compromising weatherability in high-rise applications. In the interest of weather-ability, some leeway is provided for sliding glass door sill height in certain AHJs. maximum 22.2 N (5 lbf) of operating force to open and close, not including latching hardware. The Chicago Building Code has increased the operating force requirement to 38 N (8.5 lbf). This is consistent with the force requirement referenced in NBC for doors along a barrier-free path of travel not subject to air pressure drops. Door closer manufacturers offer accessible options that limit force-to-open and closing lag time. Ninety-degree thumb-turn locks typically are made standard on manufacturers’ swinging terrace doors for compliance. additionally, along accessible routes, threshold height is limited. A 930-mm (32-in.) minimum width, turning/approach area, and low protrusion limits, as well as requirements for kick plates on swing doors also apply. Code requirements notwithstanding, accessible terrace and patio doors may be a desirable feature of the spaces being designed, making it easier for all occupants to enjoy balcony spaces, with easily operable door panels and lower-profile thresholds. Whether or not required by code, accessible operating windows may be a desirable feature of occupied spaces in skilled nursing and personal care facilities, multi-family buildings, hotels, classrooms, and dormitories. Accessible operating windows help ensure fresh air and a connection with the outdoors are made accessible to people with physical disabilities. 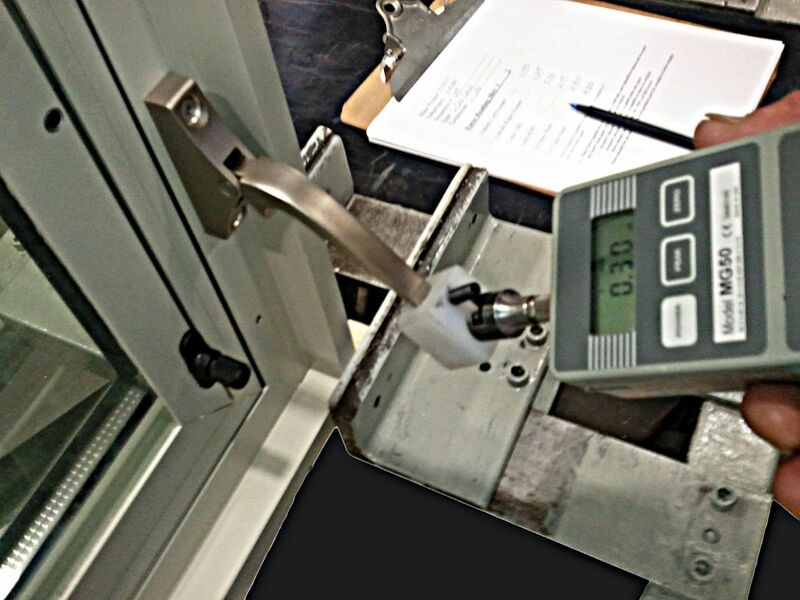 Product development and compliance testing efforts at most manufacturers are underway, to provide a broad selection of accessible window types, both manually operated and motorized. Steve Fronek, PE, leads Wausau Window and Wall Systems’ new product development, marketing, field service, technical support, and general research. 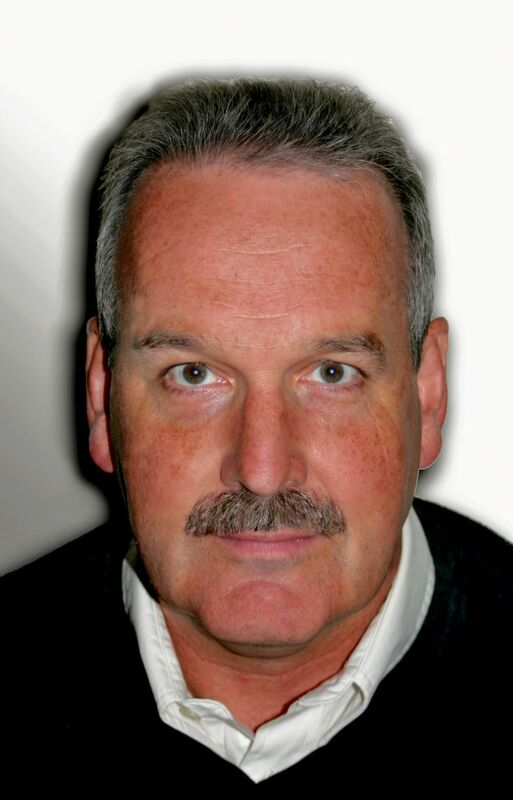 He is the immediate past-president the American Architectural Manufacturers Association (AAMA), and has served on 60 of AAMA’s committees and task groups, including guiding the evolution of thermal performance and accessibility testing standards as they exist today. Fronek is a member of the Lawrence Berkeley National Laboratory’s (LBNL’s) High-performance Building Façade Solutions Public Advisory Committee and a LEED Green Associate. He can be contacted via e-mail at sfronek@wausauwindow.com. To read about NAFS operating force limitations, click here.